Ho! Ho! Ho! Christmas is coming soon. It’s time to get ready and prepare some nice gifts for your loved ones. 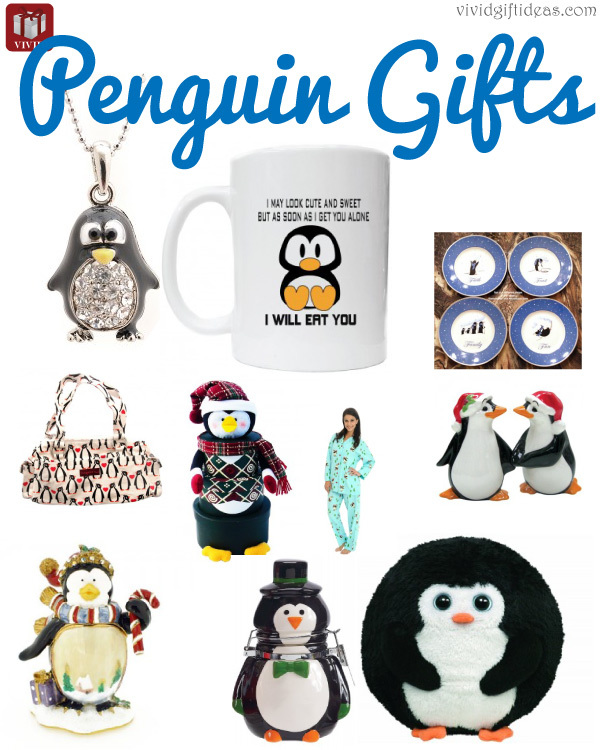 If he/ she loves penguins then you should read on for our Christmas penguin gift ideas below. 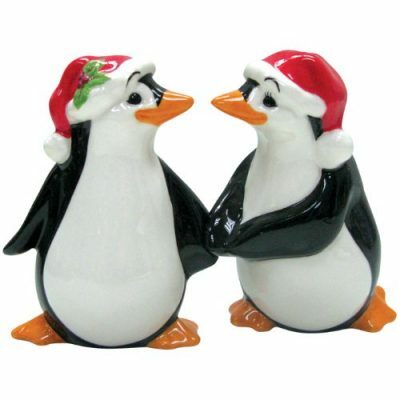 Add cuteness to any dining table with this ceramic salt and pepper shaker set. They are small and adorable. The magnet inside keeps the penguins to stick together. A great penguin collection for all. 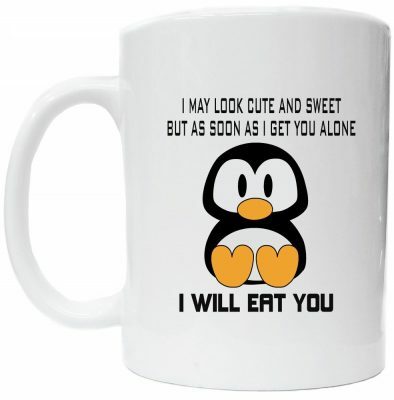 Another cute Christmas penguin gift. This white penguin mug is made of ceramic. Melt everyone’s heart when using it. Dishwasher and Microwave Safe. Get this fine penguin trinket box this Christmas for your daughter/ girlfriend/ wife. It fits to the holiday theme and looks incredibly lovely. They will love it for sure. A small Christmas gift for her. 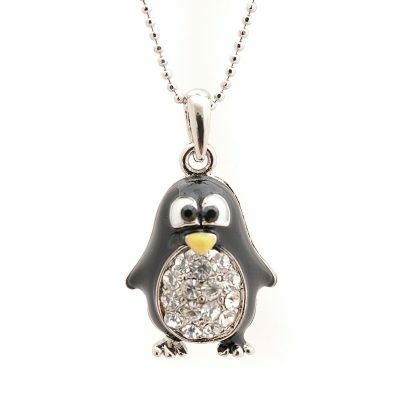 This silver plated round body penguin necklace embedded with high quality crystals looks dazzling and gorgeous. The penguin has a sparkly belly which is cute and adorable. 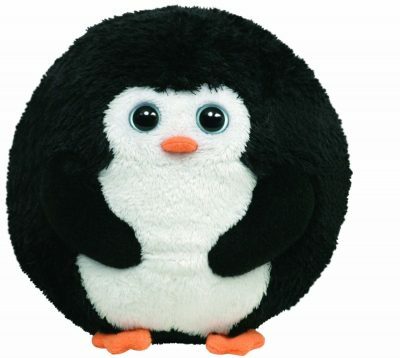 Furry little penguin from Ty Beanie Ballz Collection. An adorable penguin for kids and adults. This little guy is so cute with the big eyes! Very soft, super cuddly and extra loveable. 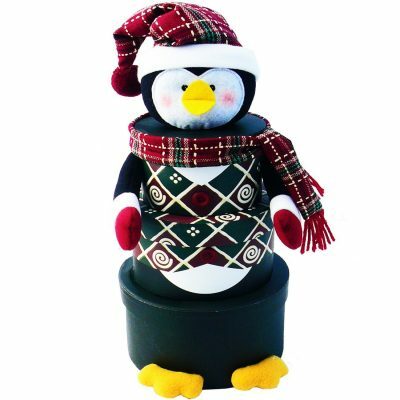 If you wanna get a gift basket/ gift tower, then you should get this adorable Penguin Christmas Holiday Gift Towers. Comes with tasty treats inside. The penguin itself looks great for Christmas decoration. Both adults and kids would love it! 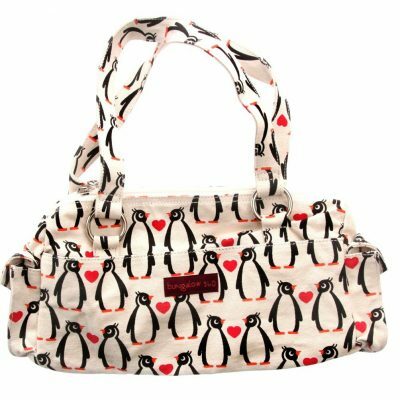 Charming penguin handbag adored by penguin lovers. This bag is made from natural unbleached canvas and printed with water based inks. Well made and durable. If she loves penguin, she will love this bag. Keep her warm this holiday season with this cute penguin with blue background pajamas. Made of 100% cotton, mid-weight flannel. It is soft and comfy. Nice pajamas to keep her warm all night long. 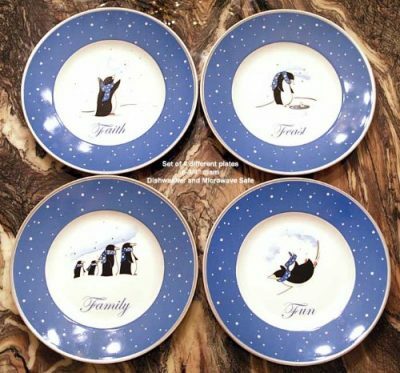 This set of penguin plates has 4 different designs. They are dishwasher and microwave safe. Perfect for appetizers and desserts. A wonderful addition to penguin collection. 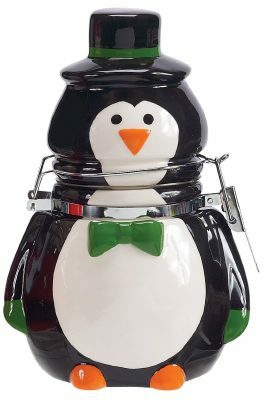 This whimsical penguin hinged jar is made from hand painted earthenware. The locking metal ring with airtight seal keeps food fresh. Great for storing candies, chocolate and nuts. Another gift adored by people who love penguin. Need penguin gift ideas for kids? Check out Everything Penguin for Kids (Christmas 2013) for more cute penguin gifts.